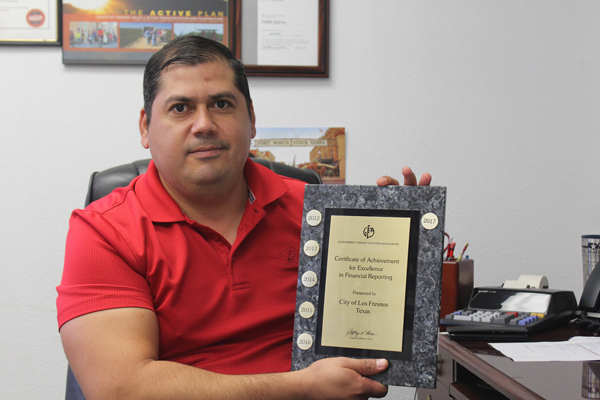 An old adage says third time’s a charm but the city of Los Fresnos finance department keeps succeeding well beyond that. Just recently, the city received yet another achievement award for outstanding excellence on financial reporting from the State Government Financial Officers Association. It’s the seventh time the city receives such distinction. And for Pablo A. Garza, the new director of finance, that is quite an honor. Garza, who took over the job last December, said he also credits city employees who helped him put everything together. But Garza said his predecessors also deserved credit. City Manager Mark Milum said the recognition means they are doing something right in the city. And during Tuesday’s Nov. 13 meeting of the city commission, Garza’s work’s as finance director was recognized by the administrative body.